ChemDesign has been recognized for exemplary efforts in increasing youth engagement and interest in chemistry by the Society of Chemical Manufacturers and Affiliates (SOCMA), the leading trade association representing specialty chemical manufacturers. ChemDesign will accept their Educational Outreach Award at SOCMA’s 95th Annual Dinner on December 5 in New York City. This is the fourth year ChemDesign has been recognized with a national honor from SOCMA. They have also been recognized for excellence in environmental, health, safety and security. Dave Mielke, president, will accept the award on behalf of the company and its 120 employees at the annual SOCMA awards dinner. 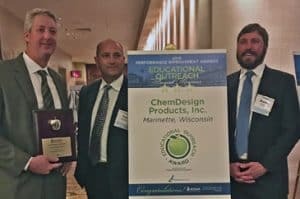 ChemDesign was recognized for its successful efforts to show students and parents that chemistry can be a livelihood for an individual with the right outlook and foundational competency in science and math. In twelve months, ChemDesign employees led chemistry demonstrations and general science discussions with more than 300 children in grades 4-8 and over 300 high school sophomore students. They also formed a partnership with the Tri-City United Way to provide three displays of chemical reactions for kids and adults at their annual Family Recreation Day, a free summer event in the community. “We are extremely proud of the hard work our employees have done in educational outreach in our region’s elementary schools, high schools and post-secondary colleges and Universities. This award reflects our commitment to fostering interest in rewarding career opportunities as chemists, lab technicians, operators and job captains in our community,” said Dave Mielke, President. “Congratulations to ChemDesign and its employees on this outstanding achievement,” said SOCMA President and CEO Jennifer Abril. “ChemDesign has gone above and beyond to demonstrate its commitment to helping students connect interest in science to real-world employment. ChemDesign, www.chemdesign.com, provides chemical toll processing for companies in the agricultural chemicals, consumer, energy, industrial and plastics industries. More than 100 people are employed at their facility in Marinette, Wisconsin. ChemDesign is a recipient of the Educational Outreach Award from SOCMA, the Society of Chemical Manufacturers and Affiliates through their partnership with the Chemical Education Foundation. ChemDesign has been a member of SOCMA since its inception and is part of their prestigious ChemStewards® program. This entry was posted in News and tagged ChemDesign, Educational Outreach Award, Family Recreation Day, SOCMA, Tri-City United Way. Bookmark the permalink.